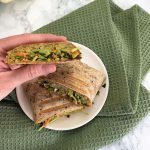 Take a bite out of these Asian slaw vegan wraps that are flavourful, savoury, peanutty, and satisfying. Made using slaw that is doused in Thai inspired flavours, combined with yummy cauliflower rice, with hints of fresh cilantro. (If you’re part of the 15% of the population that feels cilantro tastes like soap, feel free to sub in parsley instead!) Then the wraps are grilled to add delicious texture and crunch. 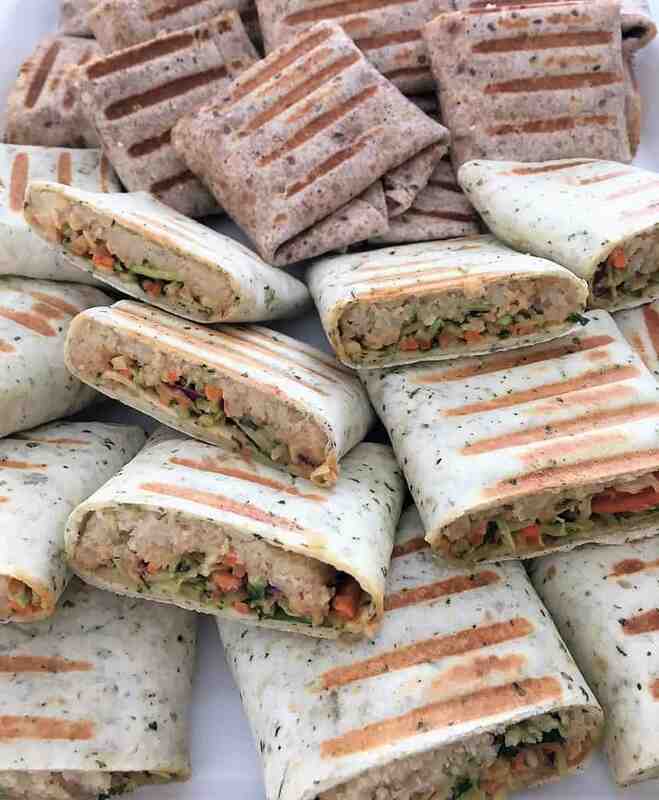 The idea for these vegan wraps came to me when brainstorming recipes for a pot luck I was attending. I wanted to bring something that would still taste great once cold. Of course, I also wanted big bold flavours and a fresh, tasty bite. The result is quite impressive! My entire family, including some seriously picky children thoroughly enjoyed these! Of course, you can make your own slaw using fresh veggies. But in the interest of saving time, I used President’s Choice slaw mixture of beet, broccoli, carrots, cabbage and kale. Then I added more carrots to the mix to give it a little more colour. But feel free to use any combination you wish, using your favourite slaw veggies. I also added cilantro to brighten up my slaw mixture and add even more fresh flavour. But again, you may use any of your favourite veggies and herbs. Parsley would also work well. When filling your wraps, make sure you do not over stuff them or they will be difficult to fold. Divide the cauliflower rice among 8 wraps. Then add a well rounded tablespoon of the slaw mixture over top. Place it somewhat centered within your wrap. Fold the sides of your wrap over. Then fold up from the bottom. This will keep the ends closed, and prevent the filling from spilling out. Grilling the wraps is completely optional. However, if you can spare the extra few minutes, I do recommend doing so. Not only does give your wraps some beautifully coloured grill marks, but it will help keep them sealed. 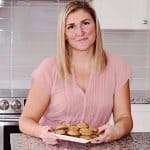 This will minimize the mess and make cutting them in half much easier. Plus, as an added bonus, it adds some delicious crunchy texture. 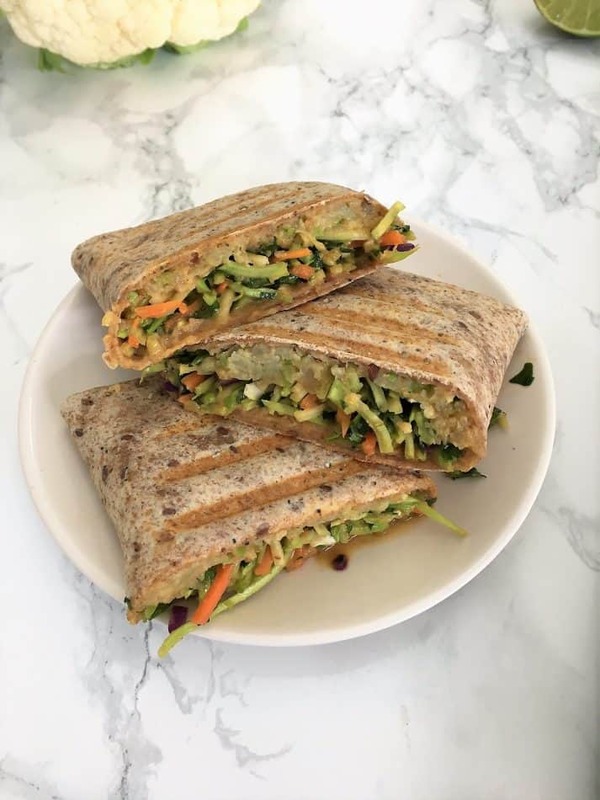 For AMAZING fresh wraps with peanutty, delicious flavour, look no further than these nutritious Asian slaw vegan wraps. Perfect to feed a crowd. Using a food processor or veggie bullet, shred your cauliflower into a rice consistency. If using a food processor, do so in smaller batches not to over process your cauliflower. You do not want it pureed. Heat the coconut oil in a large skillet over medium high heat and wait until the oil is hot. Then add your cauliflower rice and sprinkle with salt. Cook, stirring occasionally for about 10 minutes, or until lightly golden. Set aside. 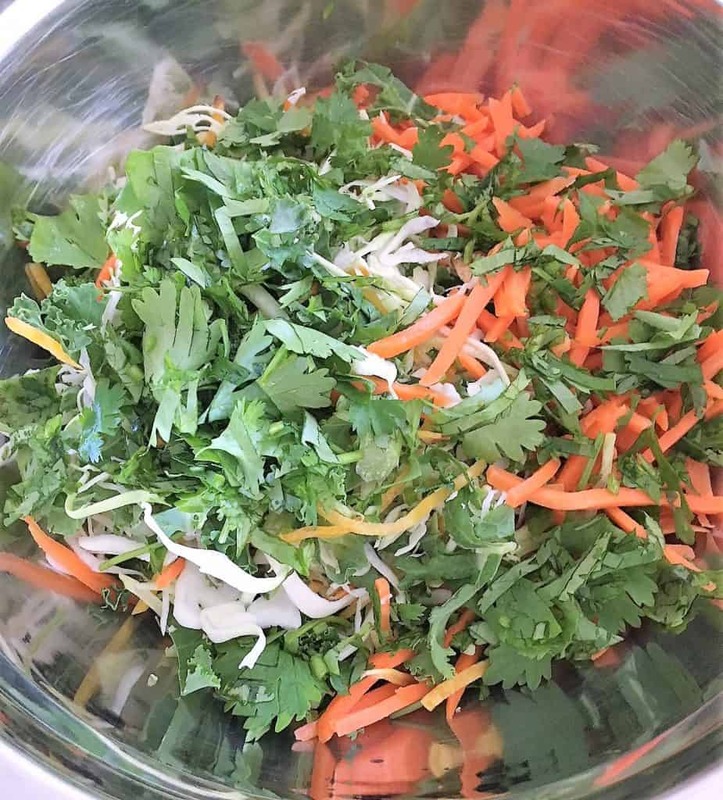 Meanwhile, add the slaw mixture and cilantro to a large bowl and set aside while you prepare your dressing. Add all the dressing ingredients to a small bowl and mix well. I use a fork to get the peanut butter to blend well into the other ingredients. Then pour the dressing over the slaw and mix well. Divide your cauliflower rice and slaw salad among your 8 wraps. 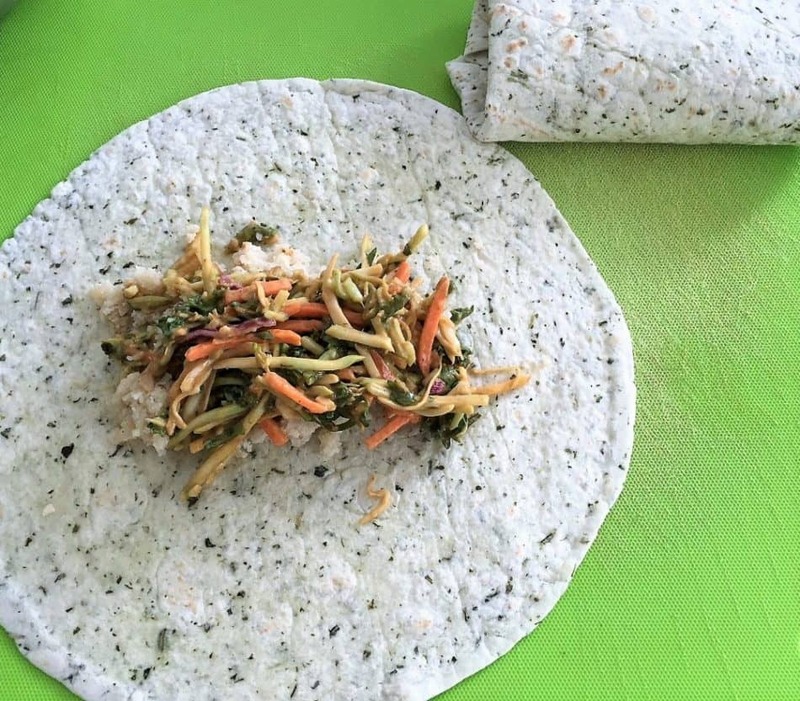 You will add roughly 2 tbsp of cauliflower rice and 3 tbsp of slaw to the center of each wrap. Fold the sides of the tortilla wrap over first and then wrap the top and bottom so nothing spills out of the edges. Do not overfill the wraps or they will be harder to close. 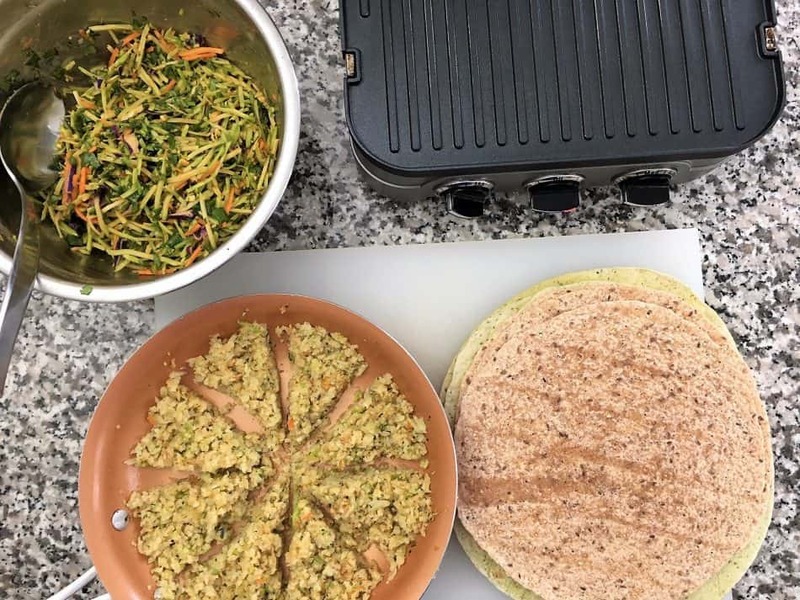 Optional but recommended: Use a panini press or grill with lid to lightly grill your wraps, folded side down, for about 2 minutes. 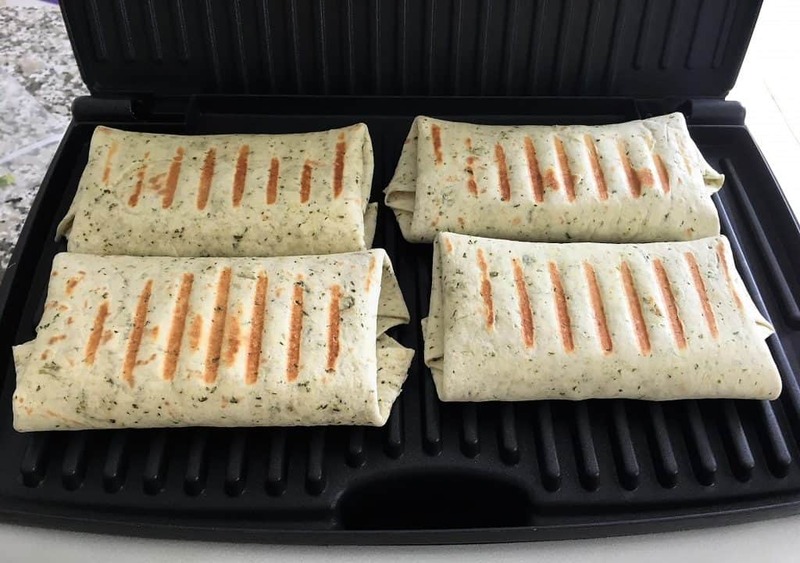 This will help hold your wraps together and give them beautiful grill marks. Serve your wraps cut in half or whole. Enjoy!